Location: Saint-Michel-de-Lanès, in the Aude departement of France (Languedoc-Roussillon Region). 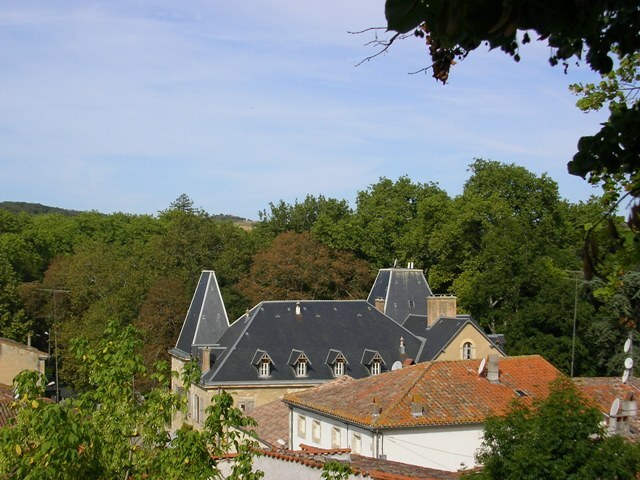 Notes: The Château de Saint Michel de Lanes have belonged to Baron de Saint Michel and Polastron, Yolande's father Polastron, girlfriend Marie Antoinette and Duchess of Polignac. The shadow of the queen haunts somehow this castle, if only by the gray pearl lounges and old roses scattered in the park. The latter is an English park bordered by the river Hers-Mort Lauragais, leading into the countryside. The castle with slate roof offers the image of a harmonious remains though transformed over the generations by owners anxious to provide an original touch: goddesses heads to the roof ridge, grotesques adorning the façade, two towers probably nineteenth century and another medieval reported in 1810 and from the castle of the village, disappeared for several centuries. This tower also has the memory of Baroness Aiceline St Michel, a friend of the troubadours and founder of the church tower wall ... legend or reality? Anyway this castle brings to our romantic village beautiful but austere. It is since 1996 the Viscount and Viscountess Vincent de la Panouse who live full time and continue to maintain it.